Winemaker Anna Monticelli (who was assistant winemaker at Bryant Family for 4 years) has brought a Cab that falls in line with the quality of its predecessor! 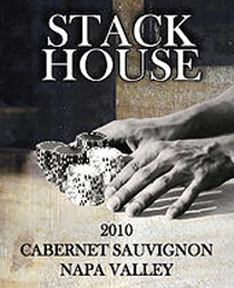 The idea for creating the Stack House label came from Anna and Mario Monticelli’s weekly poker parties with their friends. As it typically happens in Napa Valley, all the players were somehow involved in the wine industry so it became Texas Hold Em poker and wine tasting.